Uniform tire quality grading For details, see “Uniform Tire Quality Grading” that follows. Tire ply composition and materials Plies are layers of rubber-coated parallel cords. Cords are the strands which form the plies in a tire. 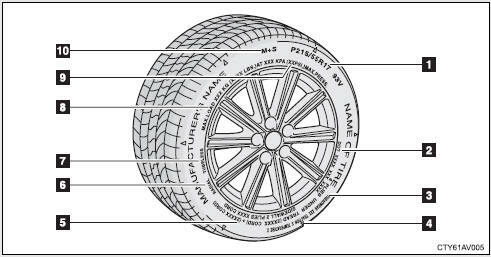 Radial tires or bias-ply tires A radial tire has “RADIAL” on the sidewall. A tire not marked “RADIAL” is a bias-ply tire. TUBELESS or TUBE TYPE A tubeless tire does not have a tube and air is directly put into the tire. A tube type tire has a tube inside the tire and the tube maintains the air pressure. Maximum cold tire inflation pressure This means the pressure to which a tire may be inflated. Summer tires or all season tires An all season tire has “M+S” on the sidewall. A tire not marked “M+S” is a summer tire. 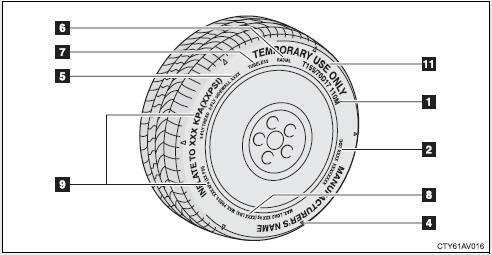 “TEMPORARY USE ONLY” A compact spare tire is identified by the phrase “TEMPORARY USE ONLY” molded on its sidewall. This tire is designed for temporary emergency use only.